This tour starts at 7:00PM on Wednesday, December 4, 2019 in Cairo, Egypt. Your flight should arrive in Cairo no later than 5:00PM on December 4, 2019. On your arrival at the Cairo International Airport, you will be met by your guide, who'll assist you with getting your Egyptian visa, immigration, customs and luggage, and will transfer you to the 5 star Le Meridien Giza Hotel, located in the shadow of the great Giza Pyramids. This afternoon, there will be some time to rest after the long flight, enjoying the hotel's grounds and its photogenic pools with the pyramids view, before we meet for our welcome dinner in the evening. After breakfast, we'll begin our immersion in the ancient Egyptian culture and history, as we mount the stately camels for an hour long ride on the Giza Plateau. We'll start our journey through the world's most ancient civilization with an in-depth tour of the only remaining monuments of the Ancient World's Seven Wonders. We'll take an extensive guided tour of the Pyramids of Giza and their guardian, the majestic Sphinx. We'll enter the Pyramid of Kephren and explore its interior, as well as the interior of the tombs of Ido and Kar, and end the day with a visit to the Solar Boat Museum. In the morning, we'll set out to visit Saqqara, the site of the oldest Egyptian pyramids, featuring the mysterious tombs beneath the ancient heaped mounds. Our Egyptologist guide will help us understand their significance and decipher the stories told in the beautiful hieroglyphics lining their walls. We'll also visit Titi's Pyramid and the Step Pyramid, the first freestanding stone building in history and the first pyramid ever built. In the evening, we'll enjoy a home hosted, authentic Egyptian dinner, one of the many highlights of our Egyptian journey. This morning, we'll tour the newly opened Grand Egyptian Museum which houses the world's largest collection of relics from Pharaonic times, the sarcophagi, statues, jewelry, and the golden treasures of King Tut. Later, we'll explore the Old Cairo, a multi-cultural area full of Jewish, Coptic Christian and Islamic monuments. We'll visit the Hanging Church, the Ben Ezra Synagogue, Abo Serga Church and the Amr Ibn el Aas Mosque, as we stroll through the city enveloped in the mysterious scents and sounds of the East. In the afternoon, we'll take a short flight to Luxor and check into our 5 star hotel, located right on the banks of the Nile. Today, we'll enjoy a more leisurely pace, as we slowly explore Luxor, the City of Palaces, which holds two thirds of the world's antiquity monuments, large Egyptian temples and vividly colorful ancient tombs. In the early morning, we'll have a rare opportunity to take an optional tour of the Queen Nefertari’s tomb (additional cost). Later this morning, we'll take a walk through the city, stopping at several artisans' workshops and enjoying some excellent shopping and lunch at a local restaurant. We'll have some free time in the afternoon to enjoy the hotel's beautiful pool and its location on the Nile. In the evening, we will enjoy the highly evocative Sound and Light Show at the Temple of Karnak. We'll start the day by crossing the Nile River to the west bank's Valley of the Kings to visit the vividly painted tombs, carved out of rocky cliffs. We'll tour Queen Hatshepsut's Temple, built by her to honor her father, the god Amun, the fascinating Memnon Colossi, the famous King Tut's tomb and the colorful Ramses VI's tomb. In the afternoon, we'll board the Mövenpick MS Royal Lily Nile Cruise, our home for the next 5 days. All cabins have large windows facing the Nile, and the ship is a floating luxury hotel with fine dining, nightly entertainment, a lounge, a sun deck and a swimming pool. In the evening, we'll visit the Luxor Temple, one of the best preserved ancient temples in Egypt, with beautifully decorated columns, a large open court, a massive entrance façade and two seated statues of Ramses II. At dawn, we'll have the option to take a memorable Hot Air Balloon ride over the Valley of the Kings and along the banks of the Nile (additional cost). Then after breakfast, we'll visit the Karnak Temple, a vast, open-air museum and the largest ancient religious site in the world. The Karnak Temple is made up of a group of temples surrounded by a wall, and dedicated to the god Amon-Ra. In the afternoon, we'll sail up the Nile towards Edfu, and watch the scenery unfolding along the banks of the Nile: the fertile lands, mountains and the golden desert as we relax on the deck. After breakfast, we'll tour the Edfu Temple, dedicated to the falcon god Horus whose divine marriage to Hathor is depicted on the temple's walls. After coming back to the ship, we'll sail south towards Kom Ombo Temple, dedicated to two gods, the god Horus and the god Sobek. Originally built for god Horus, after the increasing number of crocodiles on the island, it was rededicated to god Sobek, a crocodile shaped god. An imaginary line divides the temple into two parts, each with its own entrance, hypostyle halls and chapels. In the evening, we'll join a traditional Galabiyah party onboard the ship, as we continue sailing south to Aswan. Today, we'll tour Aswan, a city known for centuries for its cataracts and as being the gateway to the South, along a trading route from the heart of Africa to Egypt. Aswan enjoys a pleasant climate, and the Nile here flows through granite rocks, with the golden desert sands with palm trees lining the banks. Our first stop will be the Temple of Phalie, considered the most beautiful temple in the Nile Valley and dedicated to the goddess Isis and the god Osiris. After the Aswan dam was built, the temple was flooded by the Nile, and it was moved to its new location on Agilika Island. We'll also visit the Unfinished Obelisk in its original location, in a granite quarry. In the afternoon, we'll cross the Nile in a traditional Long Felucca, a graceful Egyptian sailboat, to the botanical gardens, enjoying the gentle breezes and traditional songs along the way. We'll end the day with a visit to the Aswan Market, a colorful bazaar offering various Egyptian and African goods. 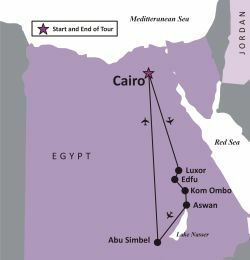 Today, we'll check out of the Nile riverboat, and fly from Aswan to Abu Simbel near the border with Sudan. We'll visit the awe-inspiring Ramses II Temples, considered the most astonishing and sophisticated temples in all of Egypt. From Abu Simbel, we'll fly back to Cairo and check into the Le Méridien Cairo Airport Hotel. In the evening, we'll enjoy our farewell dinner, and share the best adventures and memories from our journey through Egypt. Sadly, we must say our good-byes to the unforgettable Egypt today. After breakfast, we'll have individual airport transfers, according to our flight departure times, and if you are joining us for the post tour extension to Petra and the Jordan Highlights 3, we'll have an early morning airport transfer to the Cairo International Airport for the flight to Amman, Jordan. This tour ends in the morning on Saturday, December 14, 2019 in Cairo. Since there are no activities planned on December 14th, you may schedule your return flight at any time.